Have you ever heated water and had it not boil, yet when you moved the container, it started bubbling? If so, you've experienced the process of superheating. Superheating occurs when a liquid is heated past its boiling point, yet does not boil. For vapor bubbles to form and expand, the temperature of the liquid needs to be high enough that the vapor pressure of the liquid exceeds the vapor pressure of the air. During superheating, the liquid doesn't boil even though it is hot enough, usually because the surface tension of the liquid suppresses the formation of bubbles. This is somewhat like the resistance you feel when you try to blow up a balloon. Even when the pressure of the air you blow into the balloon exceeds atmospheric pressure, you still have to contend with the balloon's resistance to expand. The excess pressure required to overcome surface tension is inversely proportional to the diameter of the bubble. In other words, it is harder to form a bubble than it is to blow up an existing one. Containers with scratches on them or inhomogeneous liquids often have tiny trapped air bubbles that provide starting bubbles so that superheating won't occur. Homogeneous liquids that are heated in containers free from imperfections may heat to several degrees past their boiling point before the vapor pressure is sufficient to overcome the surface tension of the liquid. Then, once they start boiling, the bubbles may expand rapidly and violently. Boiling of water occurs when bubbles of water vapor expand in liquid water and are released at its surface. 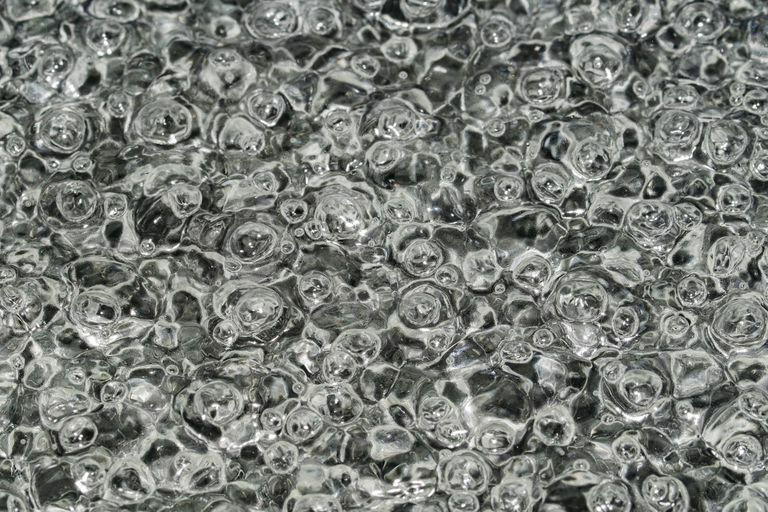 When water is heated in a microwave, it may remain undisturbed during the heating process so that there are no nucleation sites around which bubbles may form. The superheated water may appear to be cooler than it really is since the water did not visibly boil. Bumping a cup of superheated water, adding another ingredient (e.g., salt or sugar), or stirring the water may cause it to boil, suddenly and violently. The water may boil over the cup or spray out as steam. To prevent this from happening, avoid reboiling water. Boiling drives dissolved gases out of water, so when you allow it to cool before boiling it again, there are fewer nucleation sites to allow boiling at the boiling point. Also, if you suspect water is hot enough that it should have boiled, move the container with a long-handled spoon so if explosively boiling occurs, you're less likely to get burned. Finally, avoid heating water longer than necessary. Other liquids besides water exhibit superheating. Even impure homogeneous liquids, such as coffee or saline, may undergo superheating. Adding sand or dissolved gas to a liquid provides nucleation sites which will minimize the chance that superheating will occur.